Defense Ministry puts last piece into 26-mile long barrier near community of Meitar, meant to guard against terror attacks. The Border Authority and Engineering and Construction Division of the Defense Ministry marked a significant milestone on Wednesday when it closed the last section of the security barrier set up in recent months in the southern Hevron hills between the Tarqumiya Crossing and the community of Meitar. A Ministry of Defense crane was stationed in the morning in front of the barrier’s last gap, about 30 feet wide, and, one after the other, it proceeded to lift five concrete slabs, each around 20 feet high, into the gap until the barrier was completely sealed. The work, which the political echelons authorized ed in order to prevent the entry of terrorists and illegals, was headed by Brigadier General Eran Ophir of the Border Authority in the Defense Ministry. The barrier is 26 miles long and consists mostly of a wall on which additional protective measures will be installed. It is to replace the fence established in the area in the previous decade. 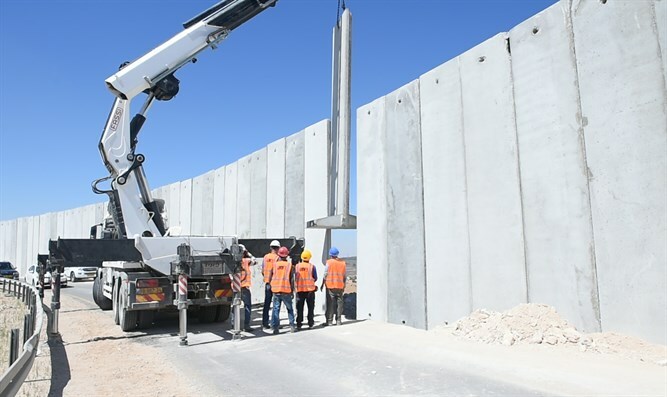 Defense Minister Avigdor Liberman said that "The completion of the wall in the southern Hevron hills is another step in the Ministry of Defense’s efforts to significantly increase the security of residents of the area, and of all Israeli citizens." "Our struggle against terror is carried out in a variety of ways, one of which is the construction of the security wall and, in this case, the Ministry of Defense and its members have once again proven their impressive planning and execution capabilities, as they did in the construction of the security barrier in other parts of the country."